With the rain finally arriving in the Bay Area, it is starting to feel like winter, and thanks to the rain and cold we are able to make and cure our annual production of Calabrian sausage , that we typically produce in January when the weather conditions are ideal for curing sausage, cold and humid. In addition to the curing of sausage I love to prepare Friscatula, Calabrian polenta with savoy cabbage, during this time of the year. I am sharing this warming recipe that was cut from my first cookbook “My Calabria” with the hopes that you will try this dish, as there is nothing better to warm you up on a cold rainy day. As a child growing up in Calabria I would never eat this dish as for some reasons I detested cabbage. I'm still not crazy about cabbage, but I have now come to love this dish. It is called “Friscatula or Frascatula” and it is the type of polenta that we would prepare in Calabria during thewinter months. In Calabria, polenta is made with fine cornmeal similar to the type used for American cornbread . It is identical to the white cornmeal that Venetians use for polenta, not the coarse cornmeal used in other parts of Italy and most commonly found here in the United States. Consequently, the Calabrian polenta cooks more quickly which results in a smooth, soft, almost custard-like texture. I find the Moretti’s Bramata Bianca, a packaged white cornmeal from Italy, indistinguishable from the white cornmeal my parents used in Calabria. My parents grew white corn in Calabria and after the harvest we would dry the corn and take it to the community mill that also ground our wheat. Because the milling stones were set up for grinding wheat, the corn was also ground fine like flour. If you are unable to find fine white cornmeal you can also use yellow cornmeal, which it works just as well. 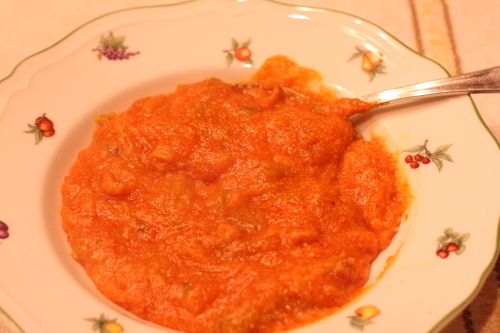 This traditional polenta dish, typically found in the Pollino area of Calabria, usually incorporates cabbage or other winter greens and pepe rosso (sweet paprika). A common variation also includes cooked beans. My mother’s recipe includes savoy cabbage, sweet paprika and a little bit of tomato puree. The polenta turns a rich salmon color from the tomato and sweet red pepper, and the tender cabbage all but melts into it. Preparing the dish is simple and easy, it involves cooking the cabbage separately and making a simple sauce where the cooked cabbage and water is later added. The cornmeal is then added to the cabbage and water and cooked for about 15 minutes until it is creamy and no longer grainy, simple comfort food. I am curious as to the meaning of “Friscatula or Frascatula.” I have never researched its meaning but I have found that the same name is used in Sicily and Basilicata. If you know the meaning please share it in the comments section. Bring 4 quarts (4 liters) of water to a boil in an 8-quart (8-liter) pot over high heat. Halve and core the cabbage, then separate each half into leaves. Cut away the thick central ribs. Stack the leaves a few at a time and cut into 1-1/2 inch (4-centimeter) strips, then cut the strips crosswise to make 1-1/2 inch (4-centimeter) squares. Add the cabbage to the boiling water and cook until the thickest part of the leaves is tender, about 5 to 7 minutes. Drain. Warm the olive oil in a heavy 6-quart (6-liter) pot over moderate heat. Add the pureed tomatoes, paprika, and hot pepper. Season with salt and simmer about 5 minutes to develop the flavors. Add the drained cabbage and 2 quarts (2 liters) water and bring to a boil. Simmer briskly for 5 minutes to allow the flavors to blend. Reduce the heat to low and add the cornmeal in a fine, steady stream, stirring constantly. Continue to cook, stirring constantly, until the polenta is thick, smooth, and creamy, with no graininess, about 15 minutes. Add small amounts of water if necessary to keep the polenta soft, not stiff. Serve at once.